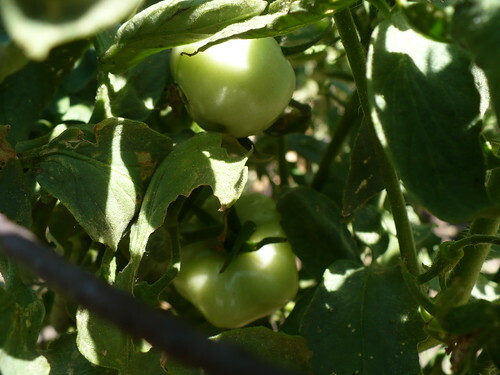 I think I’ve mentioned a couple times that we were watching our heat-set tomatoes for signs of fruit set during the heat. A few weeks later, we are not at a point where we can really get a good idea of what is going on with the different varieties. The results so far are pretty interesting! The things I’m looking for are the number of tomatoes, the size of the tomatoes, and any apparent deformities. 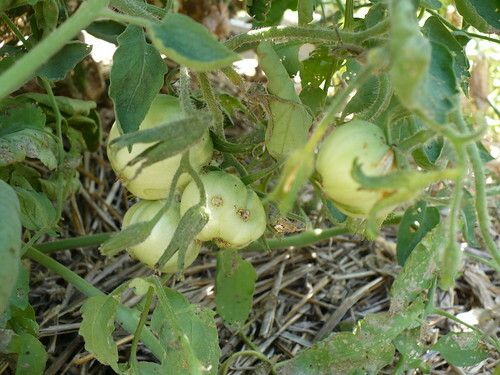 We didn’t choose the Marmande tomatoes for any reputed heat set characteristics, but it looks like they must tolerate the heat a little bit, since these tomatoes are good sized and most likely set during the hot weather. They don’t look stupendous, but they’re okay. This is ‘Sunmaster’. 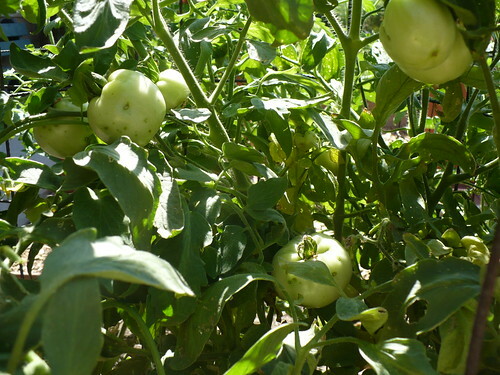 It has a few tomatoes on it, and they are large enough to indicate fruit set during the heat. While not numerous, the tomatoes look pretty good. Right now, ‘Solar Fire’ looks like the loser for the year. 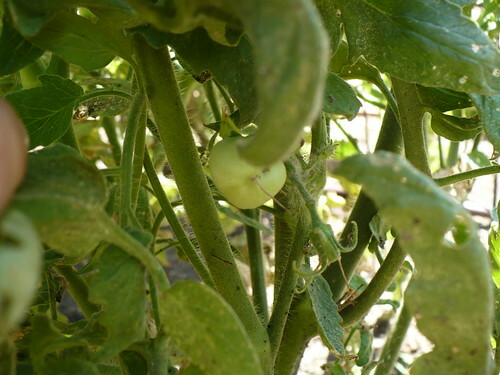 There are only a couple tomatoes on it, and they are still very small. This most likely indicates that they didn’t set until after the worst of the heat broke a couple weeks ago. It’s still better than nothing, though. If ‘Solar Fire’ is losing, I think the ‘BHN-189’ is winning. This plant definitely has the most tomatoes and the largest tomatoes on it. They definitely set during the worst of the heat! I’m a little concerned about the scarring on the fruit, but I’m giving it the benefit of the doubt for the time being. ‘Super Sioux’ isn’t looking particularly super. The two tomatoes that are set don’t look too bad, but there are only two tomatoes, that I saw. The only thing that puts it above ‘Solar Fire’ is that the tomatoes look nicer and they are larger, indicating earlier set. The ‘Florida 91’ plant is in the middle of the field right now. 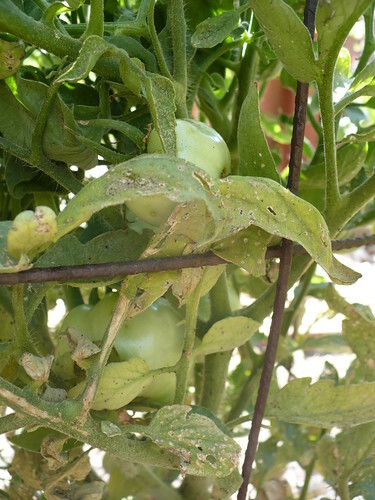 There are a decent number of tomatoes, but not as many as ‘BHN-189’, and some of the fruit are scarred or misshapen. The plant doesn’t look as nice either. ‘Sun Leaper’ is also middle to bottom of the pack. Like ‘Sunmaster’ the tomatoes look pretty nice, but like ‘Super Sioux’, there are few to be found. The moral of this story is that even “Heat Set” tomatoes don’t love continuous heat above 100 degrees (and really, who/what does? ), but they still limp along and set a little bit. Of course, as these tomatoes ripen, the other question to address is this: Is having a tomato that doesn’t taste very good better than having no tomatoes at all? I’m skeptical of the flavor potential for several of these varieties, but everyone has a different tolerance level for tomato flavor. 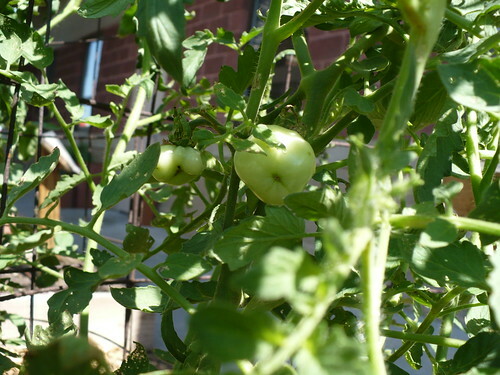 Stay tuned for more on these tomatoes in the next few weeks! 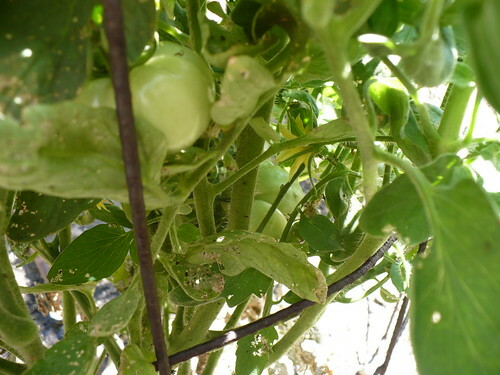 Posted on September 2, 2011, in Around the Garden and tagged heat, plant problems, Tomatoes, weather. Bookmark the permalink. Leave a comment.